Location: Near Stranraer, Dumfries and Galloway, Scotland. 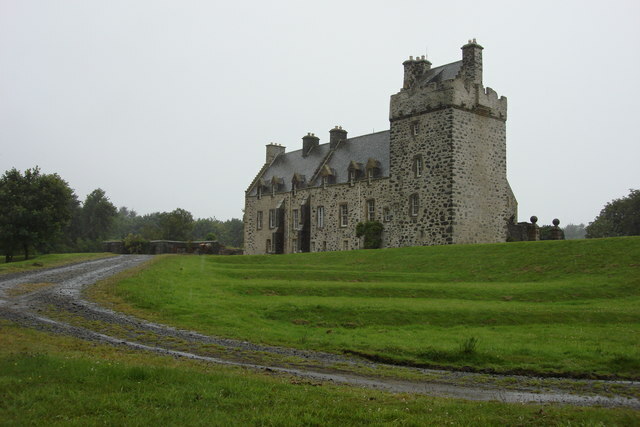 Notes: Lochnaw Castle is a 16th-century tower house five miles from the town of Stranraer, in Dumfries and Galloway, Scotland. The spectacularly located "castle" incorporates a fortalice torhous. The "central" square tower 5 stories high formed part of the "New" Castle. Lochnaw Castle shows four periods of construction - a simple 16th-century keep, 17th- and 18th-century domestic dwellings, and a mansion-house, which was later demolished. There is a plaque bearing the date 1486, on the SE wall of the keep. A chapel, built in 1704, was demolished c. 1953. An earlier, ruined castle stands on an island in the nearby Lochnaw Loch. A royal castle, this was given to the Agnews in 1363, but was sacked by Archiblad The Grim, 3rd Earl of Douglas in 1390, and subsequently dismantled. The Agnews held the new castle until the end of the 20th century. The castle, located by the loch, is occupied as a private residence.